It is a tragedy that while the developed world is talking of a society based on human values, we the people of Karnataka have to go back to religious texts for our value systems. 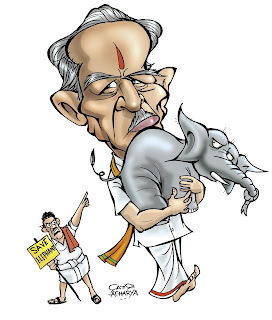 In the past few years after the Bharathiya janatha party formed their first government in the South they have been trying to impose their superstitions on the population in the most blatant manner. The machinery of the state is being shamelessly used for this purpose under the guise of education and such high flown labels. the process is taking place in such an orderly manner and the target is the younger generation. As it is the Chief minister is not known for any leaning towards rational thinking. In fact, he has been utilising the resources of the state to promote religious institutions by a mechanism of sly actions by hook or crook. The first thing he did on getting elected was to go around the maths and temples spending public money on rituals and donations to these places. During each budget huge amounts have been allocated as 'grants' to these institutions under the guise of education and development. That the expenditures of these are not under the scrutiny of any public authority must be one reason for this. These do not even call for tenders for their expenditure and everything is done in an arbitrary manner at the whims and fancies of the heads of these. The communalisation has gone to the extent that even the midday meals schemes are in the grip of these vested interests. When, eggs were proposed as a dietary supplement for children there was an uproar and the scheme was dropped due to opposition from the math heads who were against that. The nutrition of the children was sacrificed to pander to the whims and fancies of these so called religious heads. Th midday meal schemes are now being slowly taken over by a cult called as ISKCON. The International society for Krishna consciousness. These midday meals which were to be cooked in the schools and served hot to the children are being now taken over by this cult who are gradually ensnaring more and more schools into their web. This activity is being fully encouraged by the state govt. in the guise of serving quality food. This is creating unemployment among the locals who have been taken for this specific job to prepare food for the children. But, it is also a sly way to bypass the caste problem too! The food at ISKCON is supposedly cooked by the upper caste brahmins only! It is also a underhand way to spread Hindutwa by making children recite shlokas in sanskrit thanking Hindu gods for providing food paid for by the taxpayers money in a secular democracy. Not content with this level of communalisation in public life there have been more recent happenings which are worsening the situation. Last month there was conflict between the present and immediate past Chief ministers. They made contradictory statements about a particular incident and each one stuck to his guns and said that his was the truth. Instead of letting the electorate or a court of law decide on that they chose to settle the dispute in the presence of a deity at a place called Dharmastala near Mangalore. The present Chief minister Yaddiyurappa issued ads in many news papers at a cost of millions to the state treasury that a trial for truth would be held at that place on a particular date. When there were protests about the misuse of public money to settle personal scores the cost of the ads was then borne by the party or rather that was what was announced in public. The much awaited confrontation was a damp squib literally as well as figuratively. The former was due to the pouring rain and the latter due to it that the conflicting parties went to the temple at different times! One gets a doubt as to why this confrontation did not take place. It is suspected that it was at the instance of the owner of the temple who requested them not to politicise a temple which was held in reverence by a millions of people. The deity of this place is allegedly so powerful that any one who utters an untruth in his presence would die vomiting blood soon. With two parties making exactly opposite statements it was imperative that one of them would have to face that fate! If that did not happen, what would have been exposed was the powerlessness of the deity! So, one does get a doubt as to why the whole thing was called off! This was a situation where one of the parties had to be right and obviously the other to be wrong! The presiding deity would have been forced to show his powers by punishing one of them! The BJP govt in Karnataka or rather the Yaddiyurappa dispensation has survived largely due to the interference by the swamis of the various maths. Whenever there was some talk about his removal they used to spring to his rescue and warn the RSS leadership about touching him. He has already shown his gratitude to them by granting huge amounts allegedly for social service activities! What better way to repay that than by ensuring that he stays in office. He has taken back many important decisions based on their dictates too! Very recently, the land acquisition notice for the phase of the SEZ for Mangalore was withdrawn not because of any other reason but by the threat of the Swami of Pejawar math to go on a fast unto death if that was not done! There have been numerous irregularities in the notification and the protests have been going on since long. But, we are told that what clinched the issue was this threat of a fast unto death. The same has happened in another case at Gadag where land was to be taken over for a project by the multinational POSCO. There were protests from those who were going to lose their land. But, nothing much moved until the Swami of a local math called as Tontaradhya math got into the picture. Within days, the order for taking over the land was withdrawn and even those who were in favour of handing over their lands to this company were asked to seek the 'blessings' of this swami before they did so. More recent of these controversies is the teaching of Bhagawadgita in schools for all the children. It is a per project of one swami which has now been given the sanctity of a govt. project all the time the ministers and party functionaries saying that it is not so. Students regardless of their religious affiliations or lack of one are all supposed the learn what is called as the 'essence' of the Gita. While it is a religious tract being followed by only one section of the society has been ignored here. What is more important is that that India is a secular and that the state cannot support any religious activity. All these things are being merrily carried on by a government elected by the people by the due process of democracy! So, in Karnataka it is these maths and swamis who are ruling the state! The Yaddiyurappa govt. is a tool in their hands. All decisions have to be taken at their level and then passed by the govt. which is only a rubber stamp! The so called cabinet is busy lining their own pockets trying to save their chairs and from the allegations of corruptions etc. Any way this reminds of the system among the Roman catholics- everything they need from the institutions run by the religious set up needs a letter from the parish priest when it concerns a Roman catholic! That could be anything from a medical appointment to a seat in an educational institution! Most of the time this was applicable to facilities which belonged to them though the education institutions are govt. funded! These criteria are however not applicable to non Catholics! This terminology is used by them to divide the world into them and us. But, Yaddiyurappa and co have been generous. Their dictats have been applied to all people of Karnataka!